Today we're talking camping tips, tricks and hacks! What follows are the tips & tricks that we’ve used, or decided to use this upcoming camping season. Every tip, trick and hack that I use serves two purposes - to make camping more comfortable, and to save us money. I don’t want to break the budget in order to finance a camping trip. The point is to get away and have a stress free break! I can’t do that if I know I spent way too much money to get there. Here are some tips for keeping your camping trip low cost. There are numerous state parks that offer camping. Some have primitive sites only while others will offer both primitive and “hook-up” sites that include water and/or electricity. State parks are generally the most inexpensive places to camp. Because of that, they fill up quickly, so make sure you plan your trip well in advance. Find all of the state parks for your state at the National Park Service website. Camp close to home if you can. There’s no need to drive hundreds of miles to camp, unless you just want to. We don’t leave the campground once we get there, so as long as the campground itself has plenty to do it doesn’t really matter how far from home it is. Plus camping close to home saves us money in gas! Don’t make the mistake of just tossing a bunch of stuff into a cooler. You’ll likely end up making unplanned and expensive trips to the campground store. Pre-planning your meals has the added benefit of allowing you to plan around what’s on sale, saving you even more money. Thinking about what you’ll eat ahead of time also allows you to simplify meal preparation as much as possible. All of the extra time spent planning your food before your trip will be WELL worth the time saved during your vacation. I am so thankful that we have numerous “everything’s $1” stores nearby. If you do, get everything that you can from there. It will save you so much money! Here’s a great list to get you started. I have a pretty extensive wish list of items that I’d love to add to our camping gear. Most of them cost a veritable fortune though! I love to go to yard sales in the summer so I’ll be keeping my eyes open. I’ve found that some people buy a bunch of camping equipment, go camping once, realize they don’t like it and then sell everything for pennies on the dollar. Craigslist is also a great place to look for bargains. Store charcoal bricks in an egg carton for a quick and easy fire starter. My kids always make me nervous trying to roast marshmallows and hot dogs with sticks or BBQ forks. They never seems long enough, or sterile enough! These do-it-yourself roasting sticks look like the perfect solution! Nobody wants to talk about the potty needs, until you have a 5 year old waking you up at 3 am needing to potty. I don’t want to walk to the bathrooms at 3 am. A travel potty seems like a great alternative! There are a couple of options to refer to, one here, and another here. This is such a great idea! I won't have to provide any guidance at all for the kids to get dressed in the mornings. Awesome! 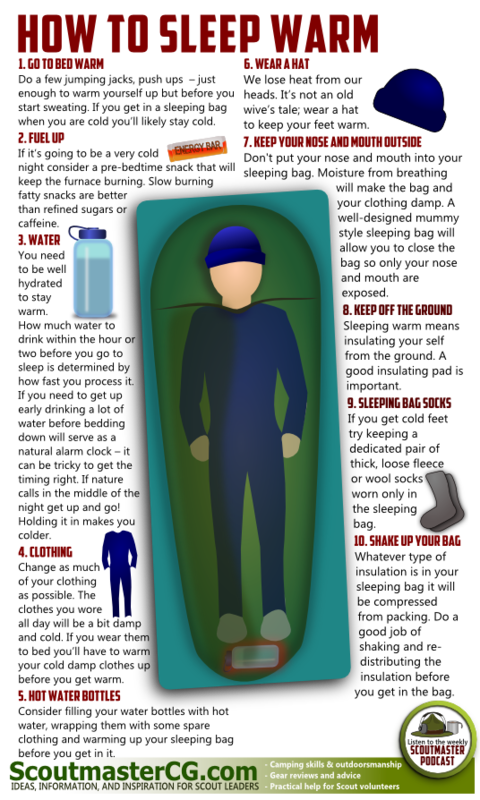 If you plan to camp while it’s cold, you don’t want to miss this information! If you have a water hookup at your campsite, use a splitter to get more access to the water. This is so much better than tying the bag somewhere or just leaving it on the ground. Keep everything organized and safe from critters! An easy way to store eggs for the trip without worrying about breakage. This works great for getting your supplies organized and up off the ground. This doesn’t include a lot of instruction, but I think I can figure out it’s construction from the photos. I might have to try this with a no-longer-in-use shelf that we have in the garage! Fill empty milk jugs with water and freeze. Keeps food cool longer and provides drinking water when it melts. A great way to keep cool in the hot summer months if you have electricity at your camp site. I'm not sure of the original source for this one. If you know, please share! Cheap and easy fire starters. Princess Dork made a bunch of these for an AHG camping trip and they worked great! Keep your camping area nice and homey with these inexpensive solar light projects. Here’s some awesome tent hacks from One Crazy House that make life in a tent so much more bearable! Cover your tent with a reflective blanket to keep it cool. That wraps up our week of all things camping! I hope you’ve found lots of things to help you plan your next trip. If you missed a post along the way, here’s a convenient list with links to all of the articles. Posted in Family Life, Frugal Fun and tagged camping, camping tips, summer, summer fun. Awesome content. Great and helpful content which will be very useful for my family and I. Buying stuff from the dollar store and saving some cash and also camping at state parks are quite great hacks. Thank you very much for sharing these tips and helping me save some money.